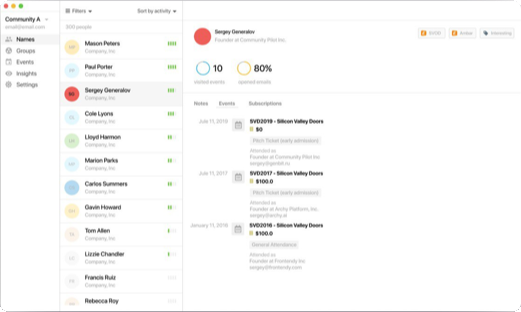 Metrics, visualization and engagement tools for community managers using Eventbrite and Mailchimp. We focus on productivity, security and privacy. Community managers need to be efficient to address the everyday challenges of a growing community. When dealing with thousands of members, organizing dozens of events and managing partners — any delay is dangerous. We understand that time is the most scarce resource of a community manager. Community data is one of the most valuable resources and we treat it accordingly. We provide top-level security for each of our products, by using encryption, secure networking, and secure databases. Privacy means being free from observed or disturbed by other people. We believe that best communities are private places, where members feel safe to exchange information and ideas. We believe that our tools should never sell ads. Each product addresses a focused problem of building communities. You can use products one at a time or all together. Collect, visualize and analyze data about your community from different channels. Then dive into an enhanced experience of community management. Copyright © 2019 Community Pilot Inc.